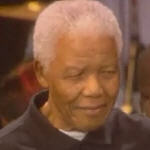 Nelson Mandela joined music stars on stage at a concert in London's Hyde Park to celebrate his 90th birthday. As well as marking the former South African president's personal milestone, the concert raised funds for Mr Mandela's HIV/Aids charity 46664. Mr Mandela told the crowd: "Even as we celebrate, let us remind ourselves that our work is far from complete - our work is for freedom for all." Up to 50,000 people watched stars including Amy Winehouse and Queen. Mr Mandela arrived on stage flanked by stars of the show, including Geri Halliwell and Leona Lewis. The 46664 charity was named after the prison number which Mr Mandela was given during the 27 years he spent behind bars for his stand against South African apartheid. Referring to the Free Nelson Mandela concert at Wembley 20 years ago, he said: "Many years ago there was a historic concert which called for our freedom. Your voices carried across the water and inspired us in our prison cells far away. "Tonight we can stand before you, free." He added: "But even as we celebrate, let us remind ourselves that our work is far from complete. "Where there is poverty and sickness including Aids, where human beings are being oppressed, there is more work to be done. Our work is for freedom for all." He added to applause: "Friends and those watching all around the world, please continue supporting our 46664 campaign. "We say tonight after nearly 90 years of life, it's time for new hands to lift the burdens. It's in your hands now, I thank you." Earlier, actor Will Smith kicked off the concert with his wife Jada Pinkett Smith, announcing: "The party begins now." He quoted singer Peter Gabriel as once saying: "If the world could only have one father, the man that we would choose to be our father would be Nelson Mandela." Lewis was one of the biggest hits of the night, singing her ballad Bleeding Love as well as Better In Time. The X Factor winner said: "When I was younger I remember my aunty and grandmother used to tell me stories about this incredible, wonderful, great man, Nelson Mandela. "We used to sing songs about him. It's incredible to sing here today at his 90th birthday celebration. I feel so honoured, I just can't begin to explain." Razorlight also performed, with frontman Johnny Borrell speaking out against the situation in Zimbabwe. Formula One star Lewis Hamilton introduced the Sugababes, describing it as an "honour and a privilege" to be at the concert. The Sugababes, who prompted the crowd to wish Mr Mandela "Happy Birthday" sang their hits Push the Button and About You Now. Annie Lennox, who performed at the Free Nelson Mandela Wembley concert 20 years ago, took to the stage wearing a T-shirt saying "HIV Positive". In a message to Mr Mandela, talking about HIV and Aids, she said: "We must do something to prevent a virtual genocide upon your people." Peter Gabriel then introduced rapper Emmanuel Jal, a former child soldier. Gabriel said the performer had the "potential of a young Bob Marley". Other performers include Andrea and Sharon Corr, Eddy Grant, the Soweto Gospel Choir and Simple Minds. Winehouse defied her detractors and left hospital for the evening to take to the stage. Wearing a "Blake" heart in her signature beehive style and a huge pair of platform shoes, Winehouse sang her hits Rehab and Valerie, drawing cheers and applause from the crowds. The night was brought to a climax with a rendition of The Special AKA hit Free Nelson Mandela, written by Jerry Dammers, which became an anti-apartheid anthem in the 1980s. Many African artists also flew in for the birthday gig, including Papa Wemba of DR Congo, and South African singers Loyiso and Kurt Darren. Families travelled from across the UK to watch the gig, including Andrea Hawker from Sussex and Debbie McElhatton from Surrey, both of whom brought their daughters. "We came to be a part of the excitement," said Mrs McElhatton.